I can't believe its been a week, friends! Last week went by so quickly. Our kiddos performed the Will.i.am song "What I Am" at our May Day program on Friday. I missed the program and field day because my boyfriend had LASIK surgery in Nashville. I steered clear of the internet last week, afraid I would google LASIK horror stories. He made it through with no complications and now has 20/20 vision! How amazing technology is! I only have 4 days left with my kiddos...I can't believe it! We have our class end of year celebration on Tuesday and I am busy preparing for that. I'm finishing up my DVD, student awards, and other goodies. I'll post more tomorrow once I've got it all complete. It makes me so sad to think of saying goodbye to my kiddos who I've grown to love so much! To celebrate this last week of school and since I know we are trying to find anything and everything to keep our kiddos busy so we can finish assessing and all the other end of year fun, I am having a sale in my TpT shop. 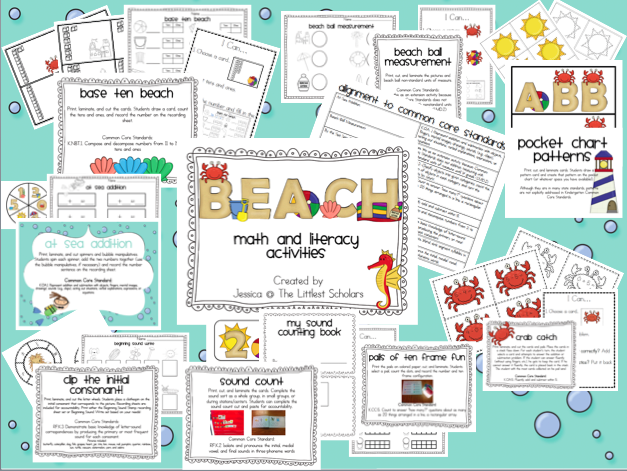 You can get my 159 page Beach Math and Literacy Station Pack for just $4. Most of the Common Core aligned activities are available in color AND black and white, so you just print and you're ready to go! I'll be back tomorrow with a peek at my end of year celebration gifts! Have a sweet Sunday, friends!